Established since 1984, Chu Chung-hung, founder and chairman of Window on China Theme Park, recruited expert model makers to build a theme park consisting of major landmarks from different parts of the world. The theme park consists of three zones or areas namely the Mini-World, the amusement park, the water park and the performance shows. Inside the Mini-World, the theme park is divided into five miniature sub-parks of Taiwan, China, Asia, Europe and America. In Mini-Taiwan, it shows the humble beginnings of its architectural history for the past three centuries, starting from Mian and Cantonese settlers until Dutch-Spanish period, the Ming to Qing Dynasty and the Japanese occupation until liberation. Replicas of Lung Shan Temple, Sun Yat-sen memorial halls, Fort San Domingo, the Chiang Kai-shek and Chiang Kai-shek International Airport. When visiting Mini-China, you will learn the richness of Chinese ancient civilization as the classical buildings from north to south as well as the splendid emperor’s wedding are all exhibited in this park before your eyes. Ancient Chinese stories are also brought to life including the fall of Great Wall of China with the tears of Meng Chiang-nu, Wulong and the pandas, the equipped village Chichenglo in Fuchian etc. Notable replicas include the Great Wall of China, the Forbidden City, the Lungmen Caves and the Temple of Heaven. It is a wonderful way to learn about history, with imagery ready to stimulate further imaginings that you may have. In Mini-Asia, the Islam and Buddhism religious roots as well as the fine culture of different Asian countries are displayed in their full glory. Interesting replicas include the Bulguksa Temple in Korea, the Todai-ji Temple in Japan and the magnificent Taj Mahal in India. 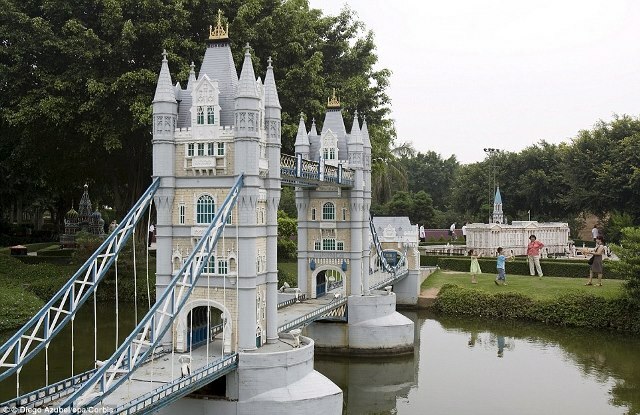 When you stroll around Mini-Europe, you’ll be amazed by the marvelous architecture styles used in many of its famous buildings including the Greek Acropolis, the gothic St. Francis Cathedral, the Romans’ Worm Cathedral and St. Basil’s Cathedral with its Byzantium element, Gothic and Roman arches. On the other hand, some remarkable sights inside Mini-America are the Statue of Liberty, the Washington Monument, Mount Rushmore and the Four Presidents, and the temple of Sun God, Kukulkan Pyramid. The Window on China Theme Park boasts almost 20 fun rides for kids and adults in its Amusement Park zone. Some of the best rides include a rollercoaster, the Open-chan Ferris Wheel, Mining train, and more. Open only during summer (July to August), the 12-storey Jumbo Wave in Water Park is the tallest water flume in Asia. Moreover, several exciting rides and recreational areas are available such as Thunderstorm, Nile Beach, Baby Captain, Water Mania, Crazy Rapid and the Open-Chan Water Castle. Access to Window on China Theme Park is easy and convenient, either by car or by public transport. If you drive, take the Longtan Interchange of National Highway No.3. The theme park is only 5 kilometers away from this point. When taking public transport, take the train to Zhongli and transfer to Hsinchu Bus as it goes directly to the location.